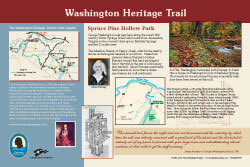 Please click here or on the image above for a .pdf of this interpretive sign on this section of the trail. The inviting roadside park with a pavilion along Rt.9 is owned by the Sons of the Revolution and maintained by Morgan County. The Meadow Branch which runs along the property boundary shows archeological remains of a mill run. James Rumsey's brother Edward owned this land and legend has it that this is the site of a bloomery and sawmill where James Rumsey may have sawed boards for the summer home Washington contracted with him to build in 1784 on lots Washington owned in Berkeley Springs. About a year later, Rumsey reported to Washington that his mill burned and the boards for the house along with it. Washington would have ridden past here traveling to Berkeley Springs, another 12 miles west. Today's Rt.9 is the modern version of the noted 18th century Warm Springs Road which went from Alexandria, Virginia to the country's first spa in Berkeley Springs. "The number of houses I undertook was four, yours included that was large. The stuff for the whole was saved but from the badness of the roads auctioned by so much rain the greatest part of it lay at the mill until the beginning of April when unfortunately the sawmill took fire in the night and was not discovered until the next day by which time the mill was entirely consumed with a great part of the plank and this stroke put it entirely out of my power to proceed with; your large house and notwithstanding utmost exertions at other mills to get the stuff necessary." 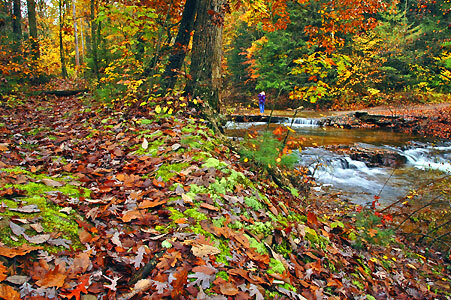 © 2000-2004, Travel Berkeley Springs. All rights reserved.